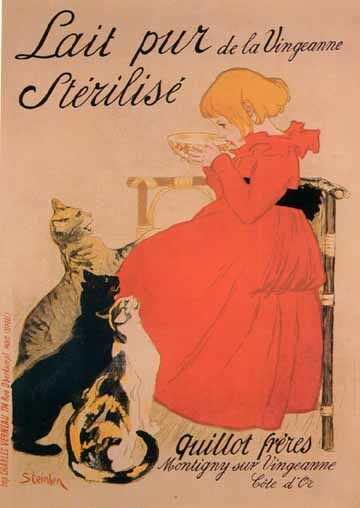 Nowhere does Steinlen's humanity shine with a greater glow than in 'Lait pur Stérilisé,' a poster for a milk distributor. His daughter Colette is again the subject; here, she carefully tastes the milk she's giving the family cats to make sure it isn't too hot for them. The cats show up in many of Steinlen's drawings and in several posters...they were important members of the household.